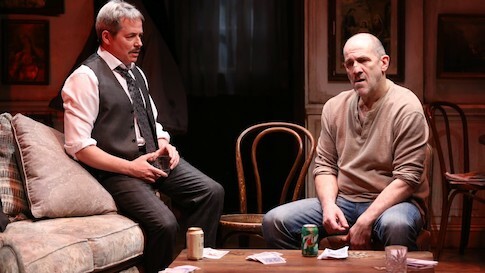 Irish playwright, Conor McPherson, who favors the mystical and the supernatural, has written a gem of a play in The Seafarer, and The Irish Repertory Theatre has clearly outdone itself in mounting it. Just about every aspect of the production hits a thrilling high note, from the magnificent ensemble acting to Ciaran O’Reilly’s terrifically smart directing to the overall staging. McPherson is well-served by a dream team whose combined talent and energy have made this one truly not to be missed. The action of The Seafarer is set on Christmas Eve in the tough area of north Dublin. This is a working class neighborhood far from gentrification–made of rough and tumble folk, but also the hard-working and devout. 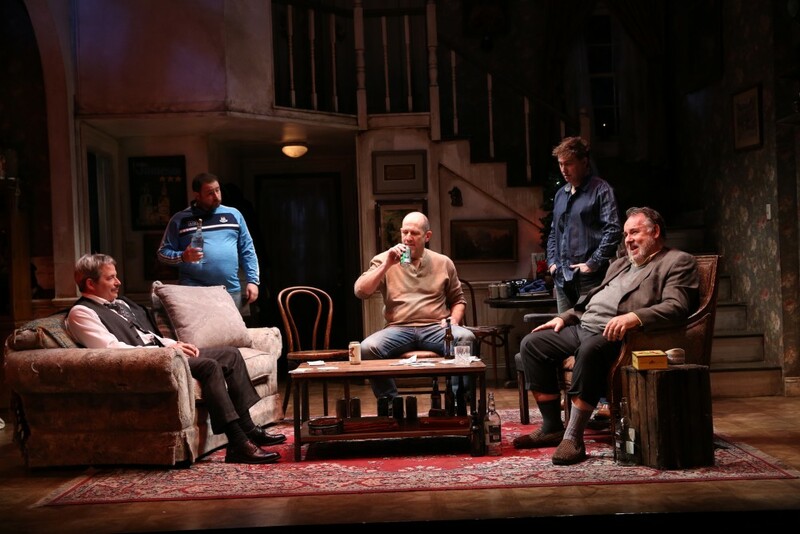 It’s an Irish archetype and a slice of rugged life captured perfectly by the playwright, down to the winos who inhabit the alley near the flat at the center of the action. It’s these same winos who will figure into the story in a subtle, but meaningful way. But that’s the beauty of McPherson’s writing–the cleverly understated often pays off in huge dramatic dividends. McPherson is also no slouch when it comes to building a plot and devising its dramatic arc. More than that, he pays attention to the details; he knows well Chekhov’s admonition that if there’s a gun on the table, it jolly well should be fired by the play’s end. So it is with the pair of glasses gone missing at the start of the play, upon which the absolutely wonderful twist of an ending results. Blindness both literal and figurative is thematic in The Seafarer. The play begins with Sharky (Andy Murray) who’s gone on the wagon, cleaning up the flat after a night of drinking by his brother Richard (Colin McPhillamy) and their pal, Ivan (Michael Mellamphy), the fellow who has misplaced glasses, rendering himself myopically blind. It turns out Ivan has stayed the night, and the party continues. These are characters the Irish well know, even as over the top and as blackly humorous as McPherson can make them. Sharky is a failure at everything he’s undertaken. Richard is a cantankerous alcoholic, yet naively innocent, with a heart of gold. As for Ivan, he’s a well-meaning nebbish, but a nebbish none-the-less. They’re a collection of losers all blind in their own way, Richard literally so, a fact that’s revealed very much into the action of the play. Later in the evening, Richard’s friend Nicky (Tim Rudd), a rival of Sharky’s, arrives with Mr. Lockhart (Matthew Broderick), a dapper gent he’s run across. Mr. Lockhart is looking to spend a pleasant evening in a card game, even though he says, disingenuously, that he doesn’t gamble. Lockhart couldn’t be more different from the others in all possible ways. What’s he doing here you might wonder, but the tip-off comes quickly. At the close of Act One, while the racket made by the winos cause Richard, Ivan and Nicky to go deal with it, Lockhart reveals to Sharky that they’ve met before, 25 years ago, when Sharky beat a rap for killing a man. That freedom came in exchange for giving his soul to the Devil, Lockhart, who’s now come to collect. As before, when he played for Sharky’s soul all those years ago, he means to make good on the deal by beating Sharky in a friendly game of cards. The card game occupies the bulk of the second act, and it seems that Lockhart will get his way, save for that clever twist ending that hinges on the pair of glasses being unexpectedly found. It’s now Christmas morning and the gift of liberation has been given Sharky by what can only be interpreted as Divine intervention. As justice is blind and as there is blind faith in this Catholic household, it’s Richard’s hand that’s beat the Devil. A strong suit in the Irish Rep’s production of The Seafarer is its authenticity, not only in the beautifully executed set by Charlie Corcoran and the costumes of Martha Hally, but in the exquisite acting of McPhillamy, and of the three boy-os. Murray’s reactive acting as he contemplates eternity in Hell is stunning. It’s this vision of Hell that informs the title of the play. There are allusions to the Old English poem of that name, which describes a man alone on the sea, as there is an allusion to Sharkey having tried his hand at the sea, but it’s Lockhart’s description of Hell that’s utterly bone chilling. In a brilliantly written monologue, Lockhart gleefully describes Hell as an eternity in a cold sea of isolation. It’s a description that echoes the narrative of the old poem, but in a way that’s infinitely more horrible to contemplate. The weak link in the piece is Broderick, who’s miscast and is thus simply not up to the part. He lends star power to the work, and in his maturity cuts an elegant, contrasting, figure to the rough edges of the others–but the role of Lockhart requires more than this. Lockhart is the Devil, after all. He’s a force that requires an imposing actor who can convey raw, chilling menace underneath the character’s veneer of civility. Broderick is well-directed by O’Reilly, but is not the man for the job. O’Reilly’s direction is top-notch; it’s plain that he “gets” this piece and he’s finessed it with a fine hand. There is a second act scene in which Lockhart and Sharky are positioned opposite each other at extreme stage left and right, staring each other down. It’s a chilling and brilliant moment that precedes the challenge of the card game. Also adding atmosphere to The Seafarer is superb lighting design by Brian Nason, particularly subtle hints of satanic red effects now and again; and sound by Ryan Rumery and M. Florian Staab, especially spooky effects that herald Lockhart’s coming and his presence on the stage.